As more road warriors ply business routes, business travel has become more of a challenge. It used to be that a businessperson flew to a destination, attended a meeting, flew home and wrote a report. Today, with all the fares, baggage restrictions, hotel plans and databases, a successful business trip depends on cunning, savvy, and electronic access. Major challenges for business travelers include flights, time and traffic. Flying today can be stressful. While most flights take off on time, delays, especially at major airports, are becoming a daily occurrence. Businesspersons fight to upgrade from coach to get away from screaming kids so they can work while they fly. And many try to carry everything on the plane, so they don�t have to wait for their luggage on arrival. But with increased carry-on restrictions, this, too, is becoming a problem. "Its� become more difficult to travel during peak days of the week, such as Friday afternoon," said Olga Salazar Garcia, Corporate Relations specialist with Coors Brewing Company in Denver. "Airline staff, as well as other business travelers, have become more arrogant and less forgiving. This adds to the stress of flying. It�s refreshing when someone is willing to help." Companies are also forcing their employees to pick airports for price, instead of convenience. Employees headed for San Francisco fly instead to San Jose, Calif., then make the hour-plus drive north, saving hundreds of dollars. Secondary airports like Newark and San Jose have gotten as big as their traditional neighbors. And when the trip takes four hours or less by car, companies urge employees to drive. And more business travelers are, themselves, opting to drive, citing less stress and more productivity. Octavio E. Nuiry, president of ON Marketing of Long Beach, California, finds that the biggest challenge for business travelers today is getting competitive prices for travel and lodging. "I�ve discovered that a good travel agent can be a tremendous help. So the best advice I can suggest is find a good travel agent�and stick with them. I also ask other business people for recommendations." But finding a good price for an airline ticket isn�t the only problem for travelers these days. Salazar has lost valuable business time waiting in lines to exchange electronic tickets when the flight they were for was canceled. "Airlines won�t honor electronic tickets from competitors," she said. "Electronic tickets are restricted to the same airline they�re purchased from and allow no flexibility when a flight is canceled. The whole process is very inconvenient, since you must get that ticket exchanged for a regular one before another airline will honor it." Nuiry has had problems storing large portfolios on planes. "I work in advertising, so I must carry large portfolios and finding a place to store them on planes has been a problem," he said. "I also carry laptop computers and other expensive electronic equipment and protecting these assets presents problems." Another headache for business travelers--frequent flier programs--something that was designed to create customer loyalty, is now turning many off. "Now there are various levels of frequent flyer passengers," said Salazar. "You don�t get the time of day from the airlines unless you have massive amounts of miles. The programs have become impersonal, and they don�t do anything nice for you anymore." In fact, there are so many frequent fliers, airlines don�t have the space to upgrade all you want this perk. Those with lower mileage are treated like any other passenger today, according to Salazar. Once at their destination, employees have to fight burgeoning suburban traffic since many clients have moved to suburban office parks. Luckily, hotel chains are constructing units within or adjacent to these campuses. But the lack of public transportation makes driving from one client to another in a major metro area a time-consuming adventure. "Even taking a shuttle to my hotel has been a hassle at some airports," said Salazar Garcia. "Ground shuttles are not as efficient as they could be." According to a study conducted by Marriott Hotels, nearly 60 percent of business travelers carry a laptop computer. Other studies show road warriors to be more self-sufficient on the road. But, at the same time, a number of businesspersons travel without a computer, using hotel computers to check their E-mail messages. "Hotels differentiate themselves through services," said Kathryn Potter of the American Hotel & Motel Association. A study by the association showed 47 percent of all domestic hotel rooms have data ports for computers, while 10 percent had rooms with fax machines and laptop computers. "Business travelers have come to expect computer hookups, faxes, and such," said Jack Little, general manager of the Latham Hotel of Philadelphia. The Latham 2000 suites each feature a laser printer, modem and fax machine, and a two-line speaker phone for conducting business. For after-hours entertainment, there�s a CD player with a library of CDs to select from, in addition to a color T.V. Each suite also has birds-eye maple furniture, a luxurious bathrobe, irons and ironing boards, coffee maker with grinder and fresh beans, and an alarm clock. Little and his fellow hoteliers increasingly want to cater to guests� desires for state-of-the-art business services, complemented by the technical luxuries of home to unwind from a challenging day. Recently, the Latham added phones with data ports in all rooms, as well as a new self-service business center featuring a computer with Internet access, credit-card-activated fax machine, a copy machine and laser printers, into which guests can plug in their laptops and print. All services except the fax machine are complimentary. "I like the hotels that offer shoe shines and the ones with good quality dry cleaning services," said Salazar. "But what I really wish is that some hotel company would begin offering hair curlers to women much as they do irons. Who has the time to set an appointment at a beauty salon, especially when you�re in meetings all day and have a black-tie affair in the evening." "I especially like Hyatt�s Gold Passport Floor [executive floor]," added Salazar, �but I wish they�d offer printers and faxes in their rooms. The Hyatt Hotels Corporation has heeded requests from guests traveling with laptop computers and installed all-in-one printer/copier/fax achines in 5,200 rooms in approximately 90 Hyatt business hotels in the U.S. and Canada. It recently renovated its Cambridge, Massachusetts, property, outfitting guest rooms with large desks, comfortable work chairs, and an easy chair for reading. And instead of locating the business center inconveniently at the back of an upper floor, a new full-service Executive Express Business Center is now part of the lobby. 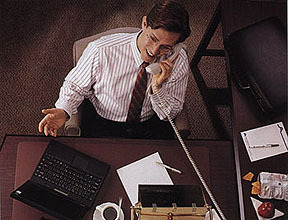 Business centers have also become the norm in many hotels. Mexico City, for example, currently has 14 hotels with centers equipped with computers, fax machines, copiers, secretarial help, and conference rooms. The Brussels Hilton converted an entire floor into an executive conference center with business services. Fiesta Americana Hotels, Mexico�s leading business hotel chain, offers fully equipped business centers. Besides its deluxe Fiesta Americana hotels, it also operates moderately-priced Fiesta Inns, especially designed for business travelers, with business services, pools, fitness rooms, cafeterias, and parking. There was a time when high-tech hotel rooms featured color television and coin-operated vibrating beds. But those days are gone. For today�s road warriors, high-tech means surfing the Internet on your TV and asking a voice-activated computer to pull back the drapes. Sound like science fiction? Maybe. Science fiction and luxury aside, many hoteliers worldwide are technically upgrading their rooms. Many mid-priced chains now have an extra phone line for computer use, and some include interactive services through TV such as room service or ordering a movie. But high-tech gadgets aren�t all hotels are planning. At select Hilton Hotels, guests can check in and ask for the room with the waterfall--the same room with the pad that massages their bodies and applies heat to their lumbar areas. Meanwhile, they can grab some juice from the mini-bar, put the yoga video in the VCR, and breathe deeply. All of these features are in one Stress-Less Room in each of eight Hilton hotels in major business-travel destinations. In each of these hotels, Hilton has also installed a Health-Fit Room, which includes its own exercise equipment, a guide to local walking and jogging trails, and copies of fitness magazines. Sleep-Tight Rooms offer a dozen features designed to block out noise and light and provide a guest with a good night's sleep, including recordings of white noise, such as gentle ocean waves, and a special alarm clock that awakens the traveler with light in the form of a slow, simulated sunrise. Marketed as Traveler Lifestyle Centers, or TLCs, they�re part of a broad effort Hilton started several years ago to find ways to help stressed-out business travelers relax, sleep better, and feel more comfortable. But all these high-tech amenities come at an ever-higher price. Hurt by a drop in occupancy rates, hotels are increasing fees or adding new charges for everything from the minibar to the telephone. Many hotels even include the maid�s tip on the checkout bill. Extra charges have shot up 20% and now account for a third of the bill, including food and drinks, according to Smith Travel Research, a lodging-research company in Hendersonville, Tenn. A few hours on the Internet can quickly add up to $50 or more a day.